Building and developing a productive, high-class e-commerce site requires more than programming and pictures, it requires business expertise, online marketing experience and an entrepreneurial culture. The team at Eko craft e-retailing applications based on the powerful Magento platform that are efficient and user friendly. From small shops to large retailers, we have the experience to deliver systems on-time, within budget and tailored to each business's specific needs. You've all done a fantastic job, the new website looks very smart and is exactly what we wanted. I know we don't know half of what you've done. What we do know is that the result is a very professional, user friendly, intuitive site that customers are loving. What I really appreciate is how you are genuinely interested in the end result, making suggestions about how to improve things here and there, and working on it like it was your own. Thank you. 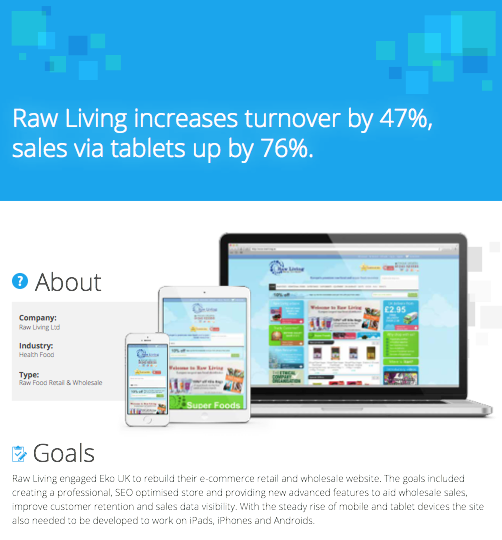 Control every facet of your store, from merchandising to promotions and more. 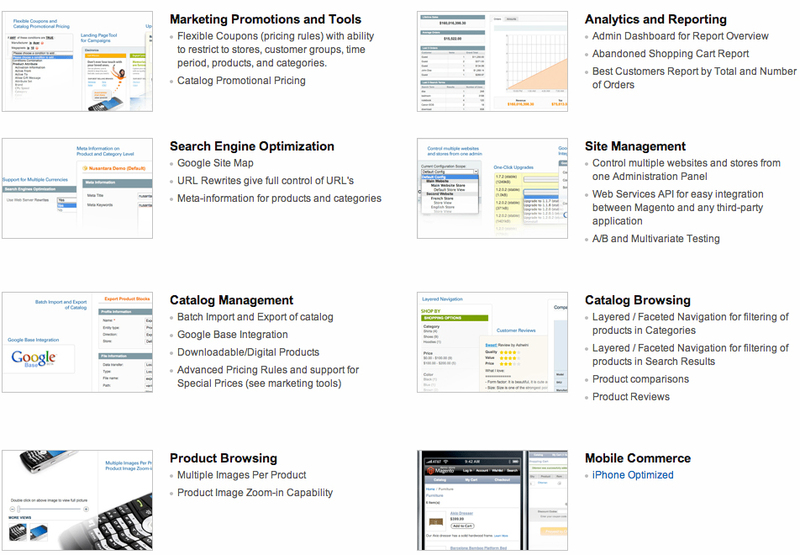 Magento's commercial open source business model yields a superior product. 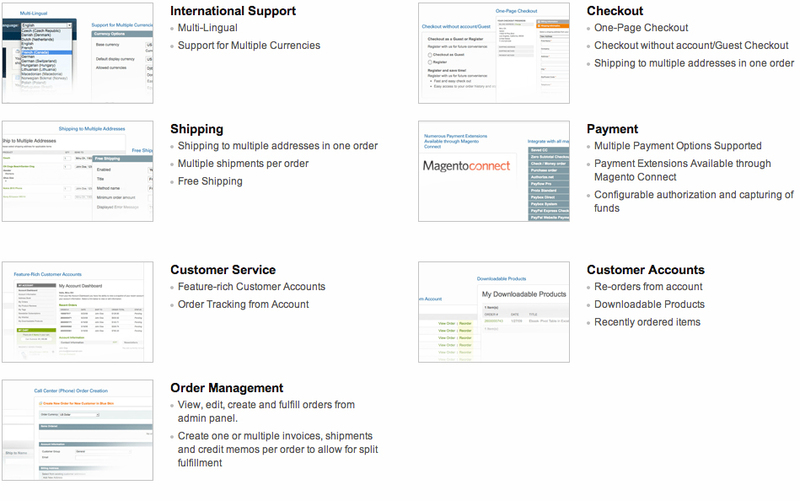 Magento's feature-set and flexibility enable merchants to increase revenue. From our offices near Brighton, our team helps companies like yours sell more goods online… whatever they may be. We do this by carefully listening to your requirements, analysing existing traffic, sales trends and creating a strategy driven by the business needs. Our e-commerce stores are complemented by creative and considered design that goes toward optimising your site, increasing online revenue, harmonising your processes and transforming your e-commerce site into a successful income generating engine. It’s worth keeping in mind that while direct end-to-end conversions are paramount to an online stores success, the relationship you build with your customers is just as important. You must ensure that your overall online presence is also well taken care of. Attention should be given to messaging and communications via email, direct relationship building with your customers via social networks and even mobile campaigns. We work with you to ensure that all aspects are considered when approaching the development or re-development of an online store.